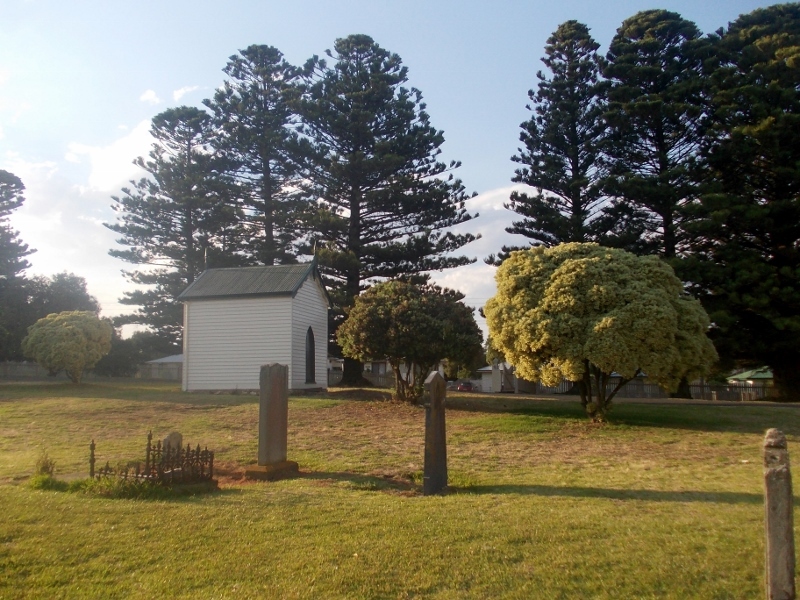 If you find yourself travelling along Victoria’s south-west coast, don’t miss the Port Fairy Cemetery. Last summer, I revisited the cemetery with the aim of photographing as many headstones as possible. 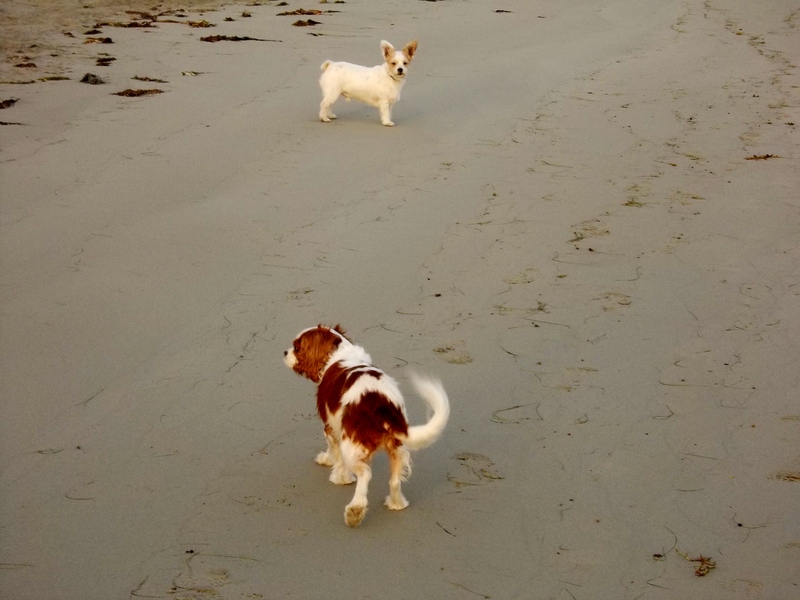 During our four days in Port Fairy, the weather was hot and our days were spent at the beach. My only chance was to head off early to beat the heat. I took the dogs, and after a stop at the beach for a run, them not me, we arrived at the cemetery around 7.30am. Taking photos and holding two dogs on leads, is not an easy task. I’m glad they didn’t see the rabbits sitting among the graves but I didn’t count on the burrs. Soon the dogs were stopping periodically to pick burrs from their paws. I didn’t get as many photos as I would have liked but I have captured some of the older and more interesting headstones. I will post the photos in two parts. 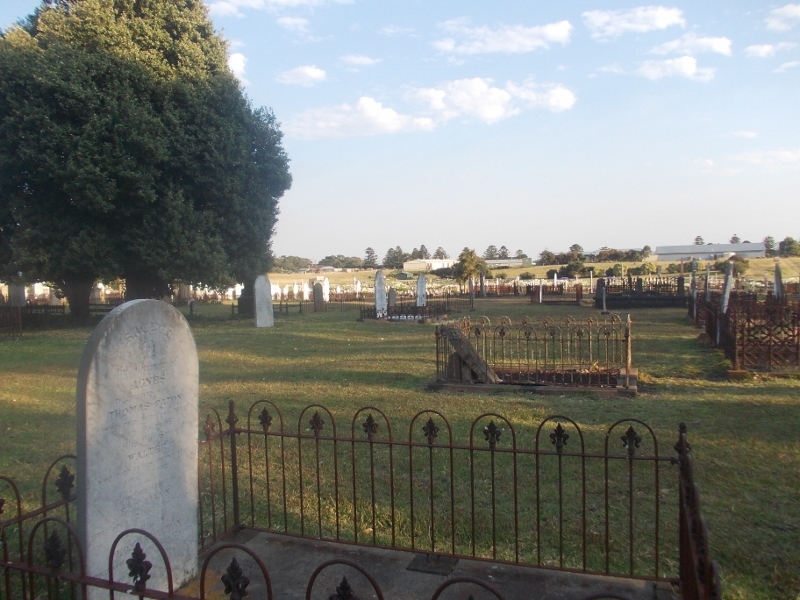 On one of my past visits to the Port Fairy Cemetery, I joined a tour run by the Port Fairy Genealogical Society. It was fantastic and I wished I had our knowledgeable guide Maria Cameron on this visit as I tried to remember the stories behind the graves. “BELFAST.” The Age (Melbourne, Vic. : 1854 – 1954) 21 Nov 1855: 6. . 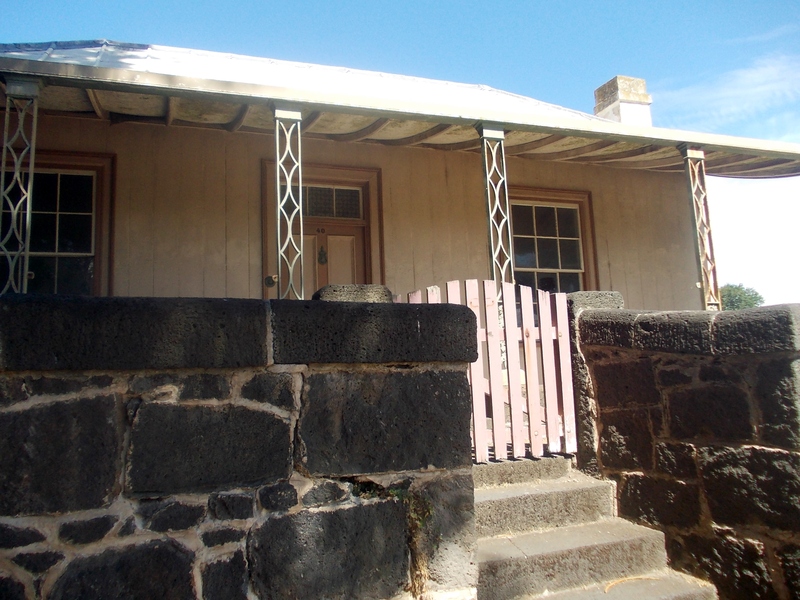 This was the home of John Mills in Gipps Street, Port Fairy just across the road from the port where he was harbour master. FORMER HOUSE OF JOHN B. 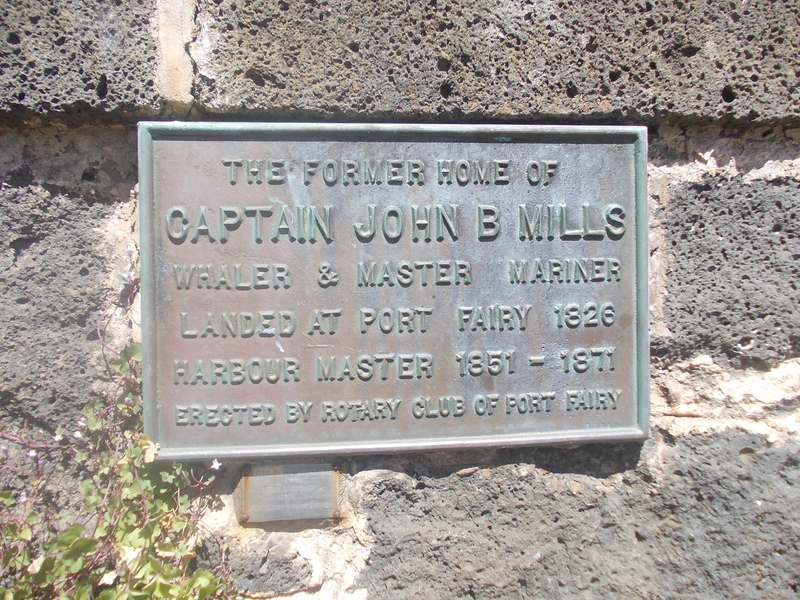 MILLS, GIPPS STREET, PORT FAIRY. “BELFAST.” Portland Guardian (Vic. : 1876 – 1953) 28 Sep 1877:. 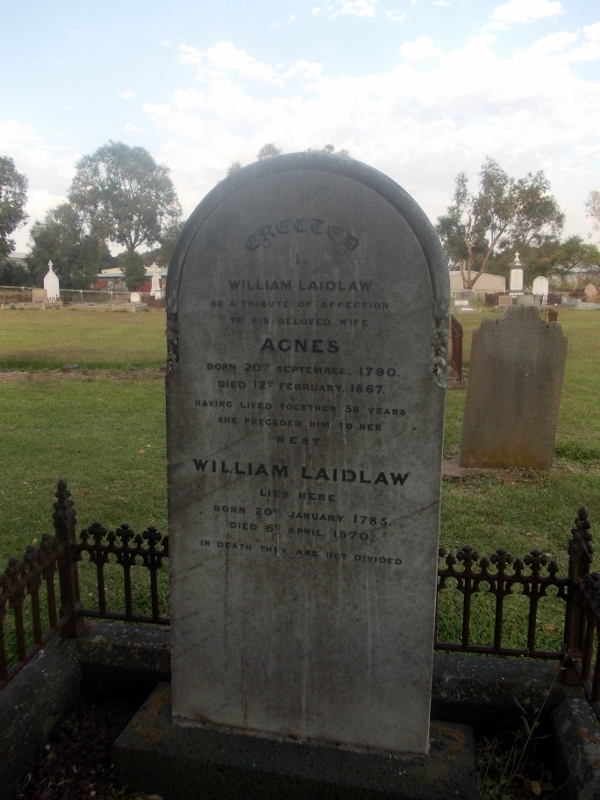 William and Agnes Laidlaw were early pioneers of the Port Fairy district, arriving from Scotland with their family around 1841. William was born on 20 January 1785, and died on 6 April 1870, and Agnes was born on 20 September 1790 and died on 12 February 1867. “Family Notices.” Illustrated Australian News for Home Readers (Melbourne, Vic. : 1867 – 1875) 23 Apr 1870. At least two of their children had great success. David Laidlaw went on to serve five times as Mayor of Hamilton and was also a leading businessman in that town. 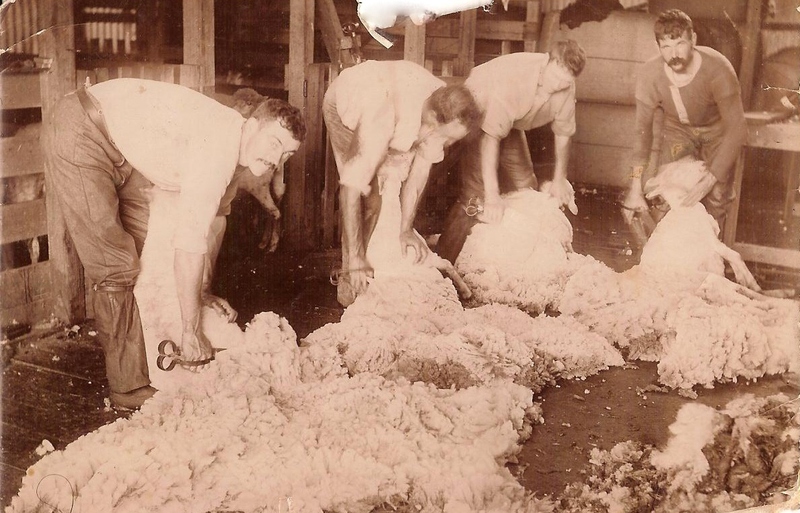 Robert became well-known in the Heidelberg area as a landowner and sheep breeder. The following is a family photograph taken at Robert’s 90th birthday. Robert is at the front with the white beard and brother David to his right. “A Nonagenarian Birthday Party.” Table Talk (Melbourne, Vic. : 1885 – 1939) 23 May 1907: . James Andrews (1780-1855) and Elizabeth Andrews (1811-1870) nee O’Brien and their two sons, Michael and Patrick lie in the following grave. HEADSTONE OF JAMES AND ELIZABETH ANDREWS AND THEIR SONS MICHAEL AND PATRICK. There was little information around about the Andrews family but I thought I would check shipping records. An Andrews family arrived at Portland during October 1853 aboard the Oithona. They were from Meath, Ireland, matching the headstone. The family consisted of James, aged 56, Elizabeth aged 45, Patrick aged 12, Fanny aged 10, James aged nine and Therese aged 2. 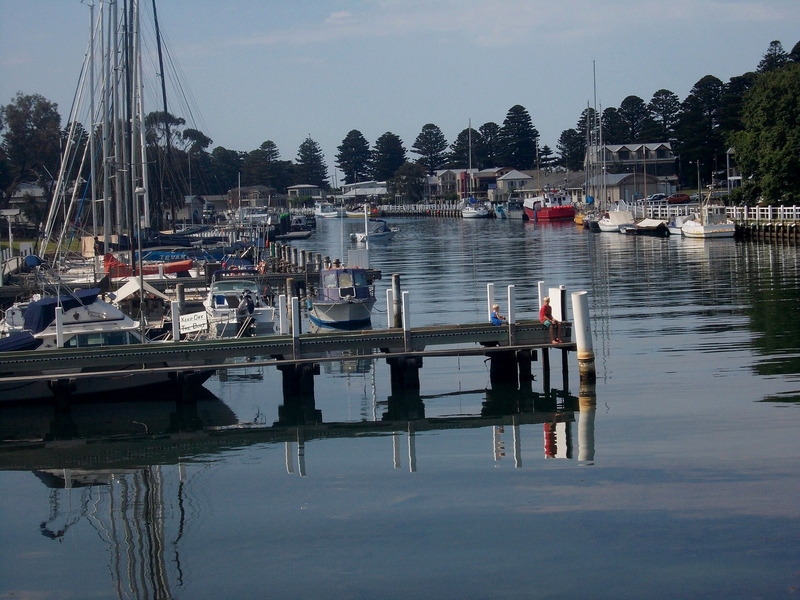 On arrival James Sr. and the family went on to Port Fairy of their own account. 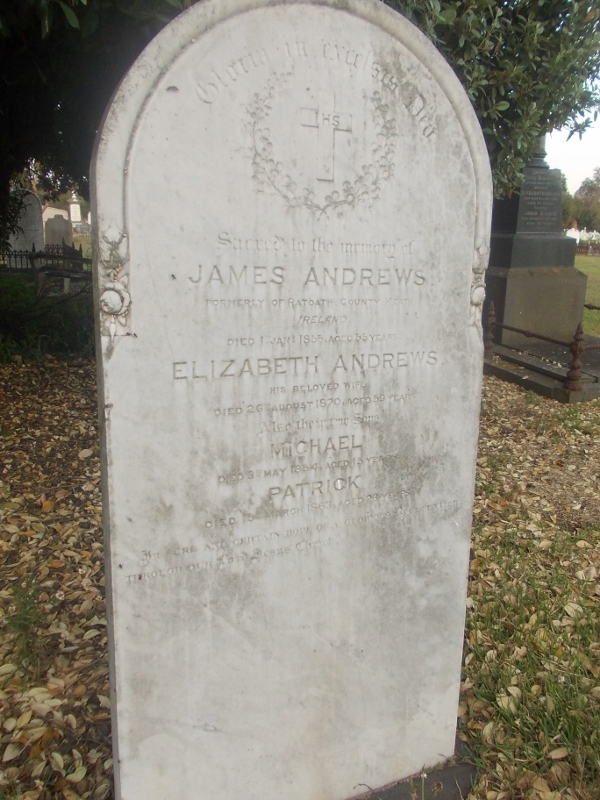 If this is the same Andrews family, James was in Victoria only two years before he died. 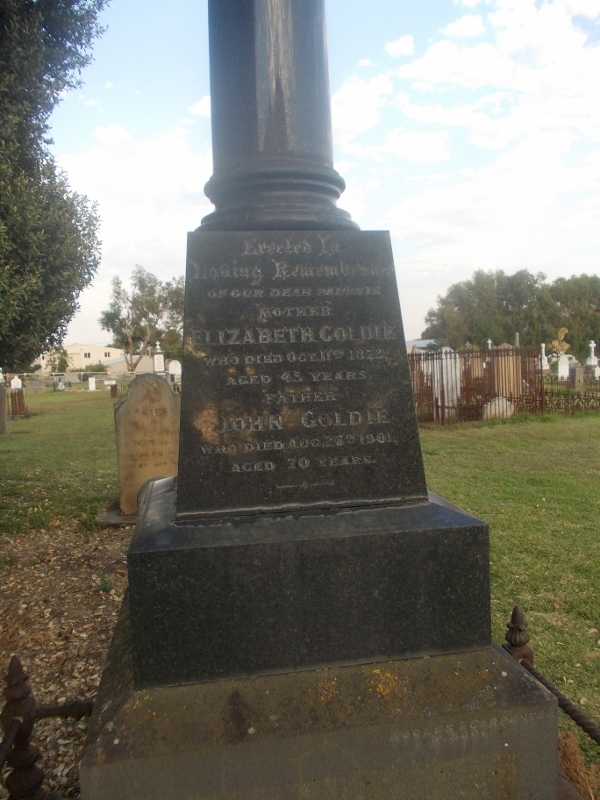 Instead, I got the following photo showing John and Elizabeth Goldie epitaphs. John Goldie and Elizabeth Clarke arrived in Melbourne aboard the Greyhound in 1862. With them were their children, Elizabeth aged 11, James aged 2 and Margaret aged 1. 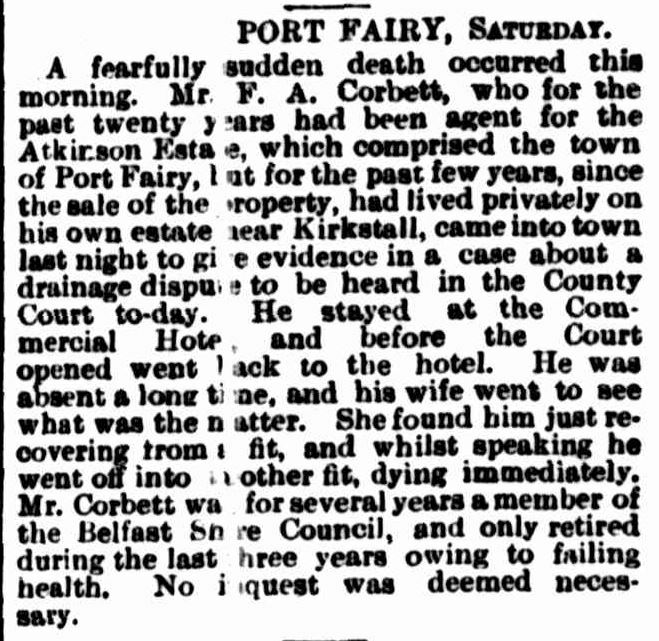 John was born in 1862 at Port Fairy and Margaret barely survived the voyage, dying in 1862. John Goldie Sr. was a pioneer of the agricultural industry, working with the Agricultural Department planting experimental crops. 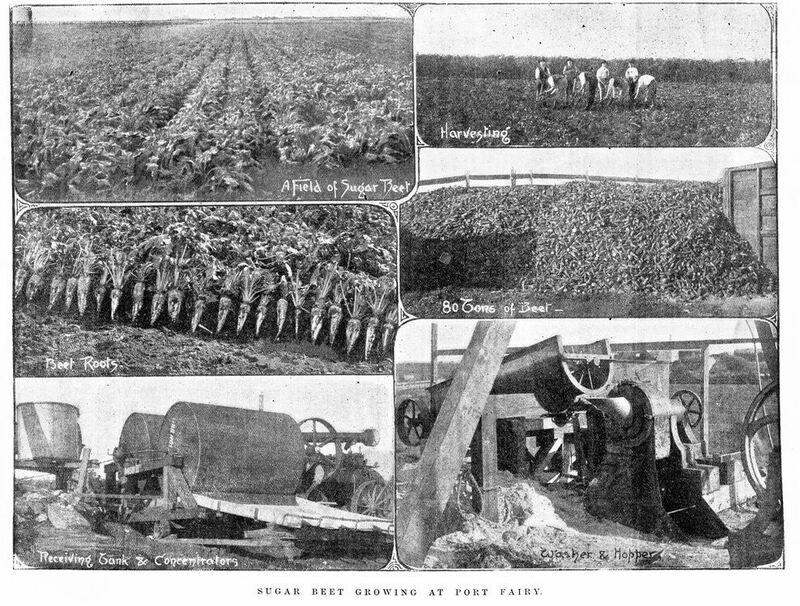 Photos of one of his experimental sugar beet crops are below. John died in 1901 after a cow knocked him down. Elizabeth had passed away 29 years earlier aged 45. 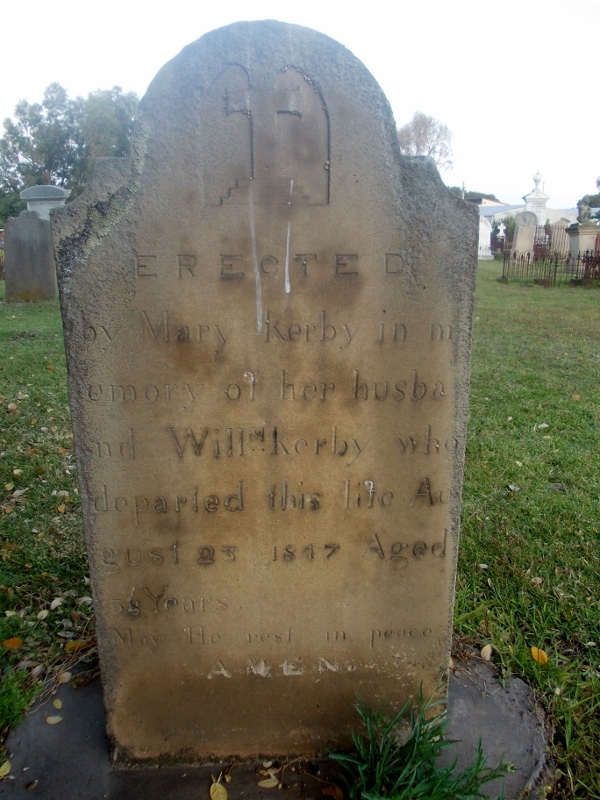 The grave of William Kerby goes back to the early years of the cemetery. William was buried in 1847 in a grave with headstone and footstone arranged by his wife Mary. Look a little closer at the next headstone and a sad story begins to emerge. 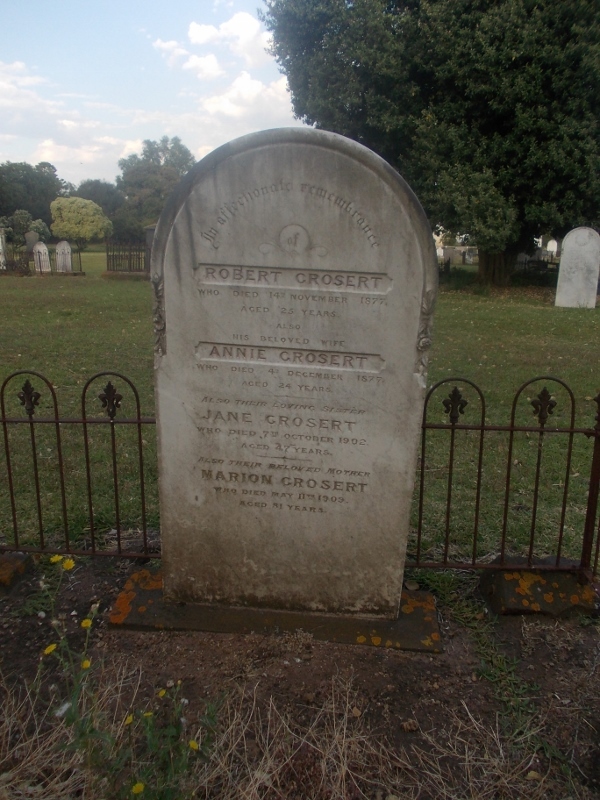 A check of the marriage record of Robert and Annie Grosert sees the story turn sadder still. Robert Grosert, the son of a Port Fairy butcher and himself in the trade was born in 1852. He married Irish immigrant Annie Greer in 1877. By 14 November of that year Robert was dead and by 4 December, so was Annie. George Best was born in Port Fairy in 1853, a son of George Best and Lucy Weston. He married Emilie Melina Jenkins in 1877 at Wagga Wagga, NSW and they settled at Port Fairy. George enjoyed sailing and it was while competing in a regatta on the Moyne River at Port Fairy in March 1891, he was knocked overboard and drowned. A diver recovered George’s body from the river floor. A team of townspeople worked on George for two hours trying to revive him. An account of the drowning appeared in the Portland Guardian on 13 March 1891 and described the incident and the preparations of the diver which makes interesting reading. An inquest was held into the accident. 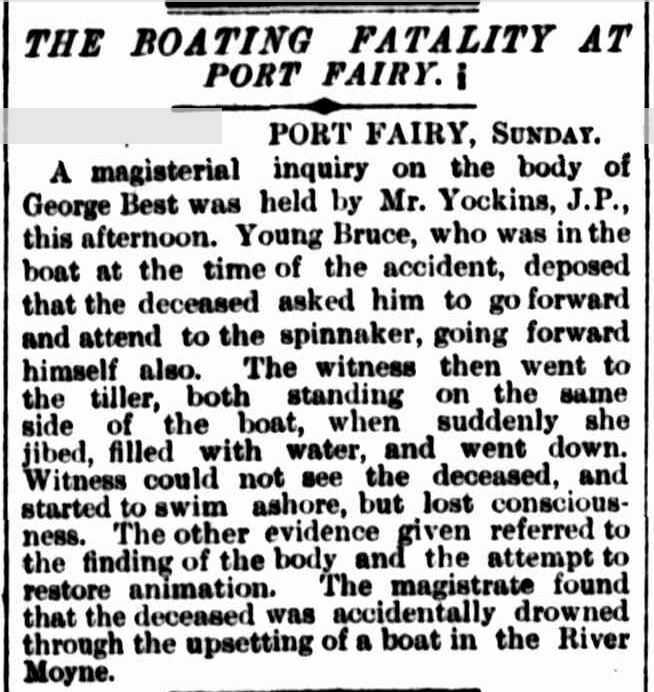 “THE BOATING FATALITY AT PORT FAIRY.” The Argus (Melbourne, Vic. : 1848 – 1957) 10 Mar 1891: 5. Web.<http://nla.gov.au/nla.news-article8482214&gt;. Coincidentally, George’s father, George Best Sr. a Port Fairy saddler, drowned in almost the same place 30 years before. His body was never located. “THE EDUCATION DIFFICULTY SOLVED.” The Age (Melbourne, Vic. : 1854 – 1954) 23 Apr 1861: <http://nla.gov.au/nla.news-article154888852&gt;. 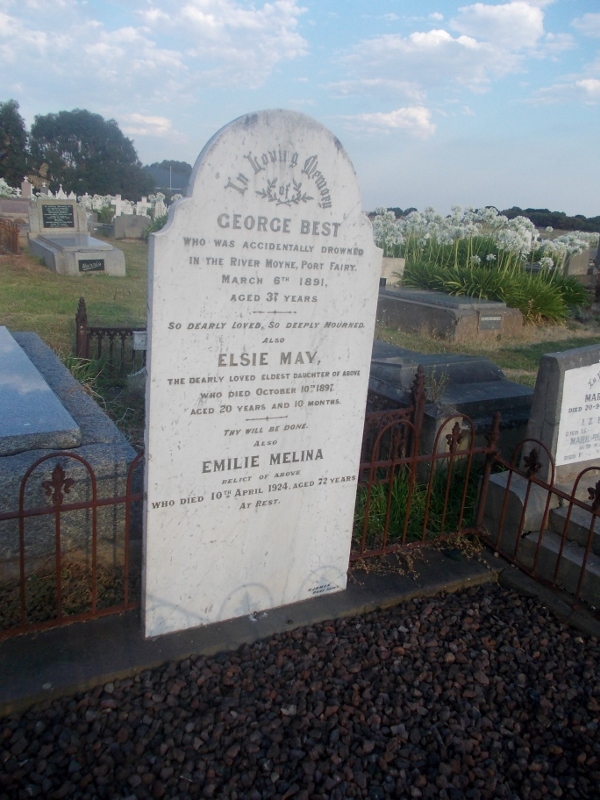 George and Emilie’s daughter, Elsie May Best was buried with her parents. 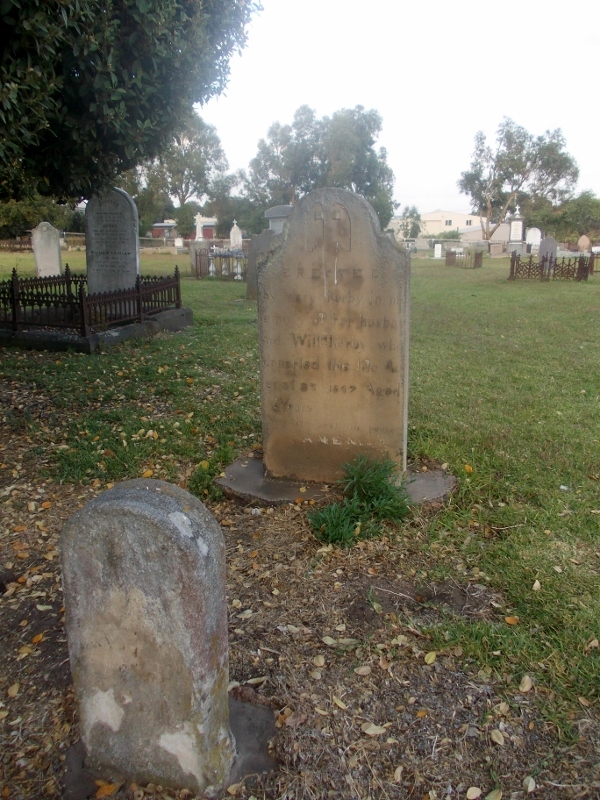 She died on 10 October 1897 at Port Fairy aged 20 years and 10 months. “Family Notices.” The Australasian (Melbourne, Vic. : 1864 – 1946) 23 Oct 1897: 55. <http://nla.gov.au/nla.news-article138629574&gt;. 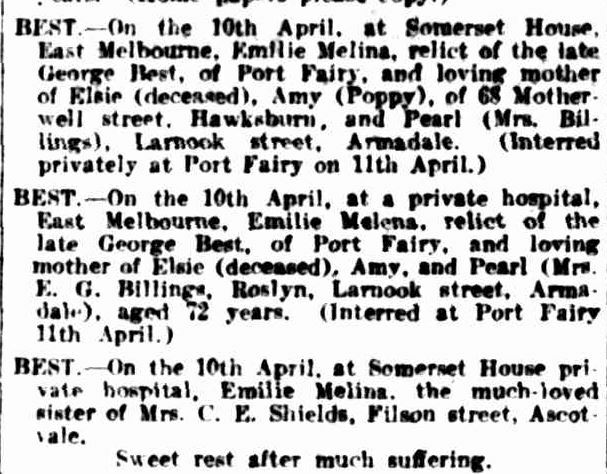 George’s wife Emilie Melina Jenkins died in a private hospital Somerset House in East Melbourne on 10 April 1924. “Family Notices.” The Argus (Melbourne, Vic. : 1848 – 1957) 12 Apr 1924: <http://nla.gov.au/nla.news-article1903476&gt;. When you walk through a country cemetery and see dozens of unfamiliar names, then later research those names, it’s amazing what you can dig up, so to speak. Francis Alexander Corbett is one such name. 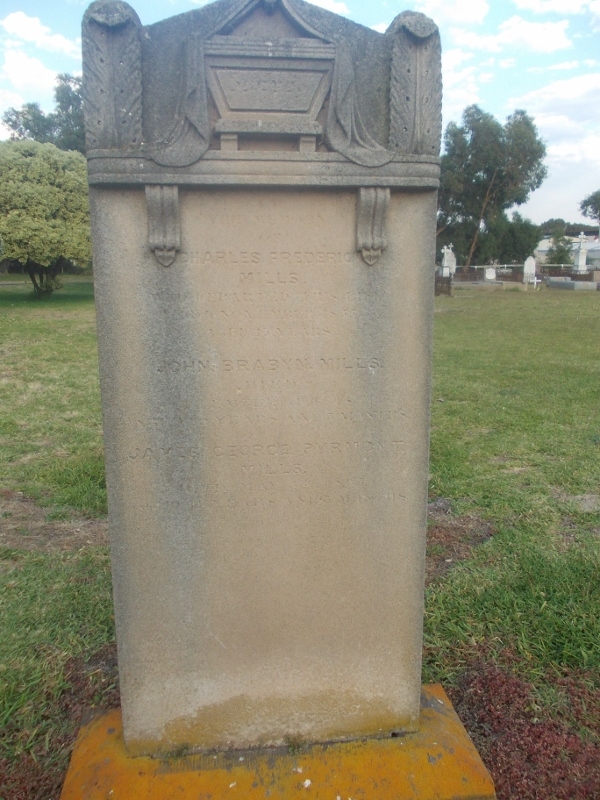 Francis born in 1818, was buried in the Port Fairy cemetery with his wife Ellen Louisa Lane. 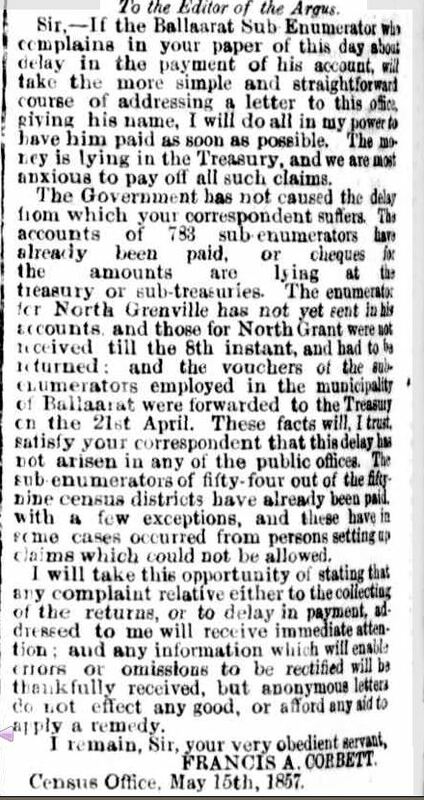 After searching Trove newspapers, I discovered that Francis arrived in Australia in search of gold and after some time on the diggings went to Melbourne and worked as a reporter for the Argus. Not fond of the work, he moved to the Census Commission conducting the 1854, 1857 and 1861 census as Census Secretary. 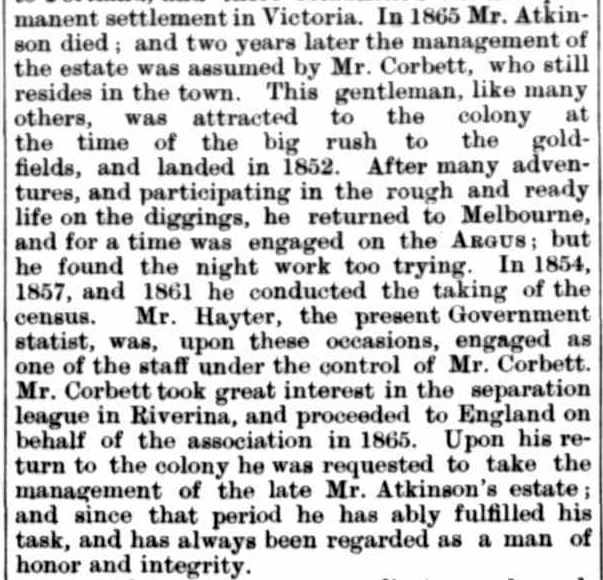 He was also a life member of the Royal Society of Victoria. 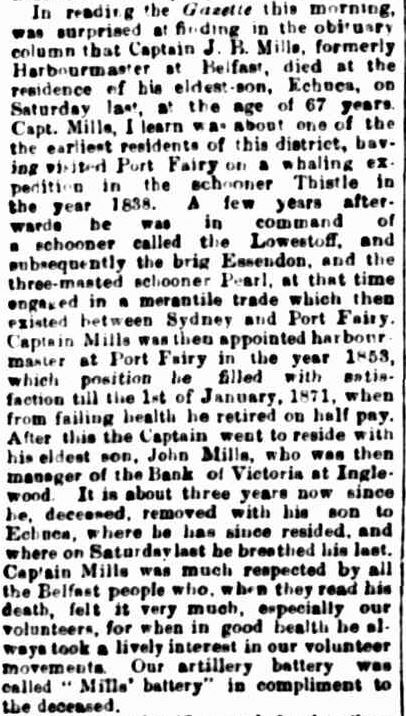 “Western Seaports of Victoria.” Australian Town and Country Journal (Sydney, NSW : 1870 – 1907) 5 Jan 1889 <http://nla.gov.au/nla.news-article71113608&gt;. 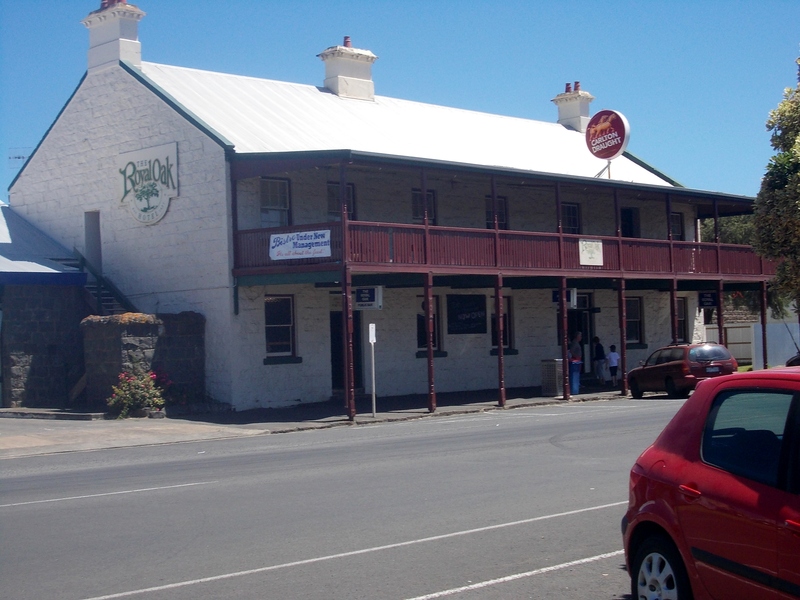 Francis was visiting Port Fairy when he died suddenly at the Commercial Hotel (now Royal Oak Hotel) on 10 June 1893. “Family Notices.” The Australasian (Melbourne, Vic. : 1864 – 1946) 17 Jun 1893: 42. <http://nla.gov.au/nla.news-article138656519&gt;. “COUNTRY NEWS.” The Argus (Melbourne, Vic. : 1848 – 1957) 12 Jun 1893: <http://nla.gov.au/nla.news-article8563251&gt;. The information contained in Francis’ will was even more enlightening especially that about his brother John Corbett. “Wills and Bequests.” Table Talk (Melbourne, Vic. : 1885 – 1939) 28 Jul 1893: <http://nla.gov.au/nla.news-article145711319&gt;. 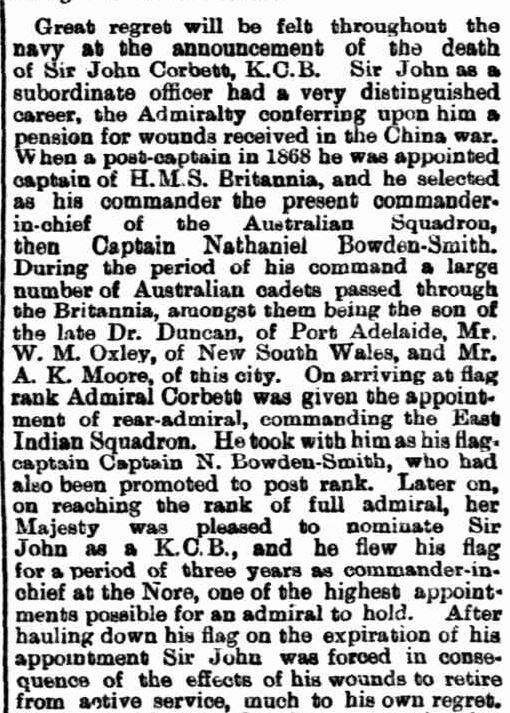 I tracked down John Corbett or rather, Admiral Sir John Corbett born 1822 and died 1893, five months after Francis. “[No heading].” South Australian Chronicle (Adelaide, SA : 1889 – 1895) 16 Dec 1893: 4. <http://nla.gov.au/nla.news-page8442835&gt;. On 4 December 1904, 11 years after Francis, Ellen passed away at St Kilda. “Family Notices.” The Argus (Melbourne, Vic. : 1848 – 1957) 5 Dec 1908: <http://nla.gov.au/nla.news-article10188785&gt;. 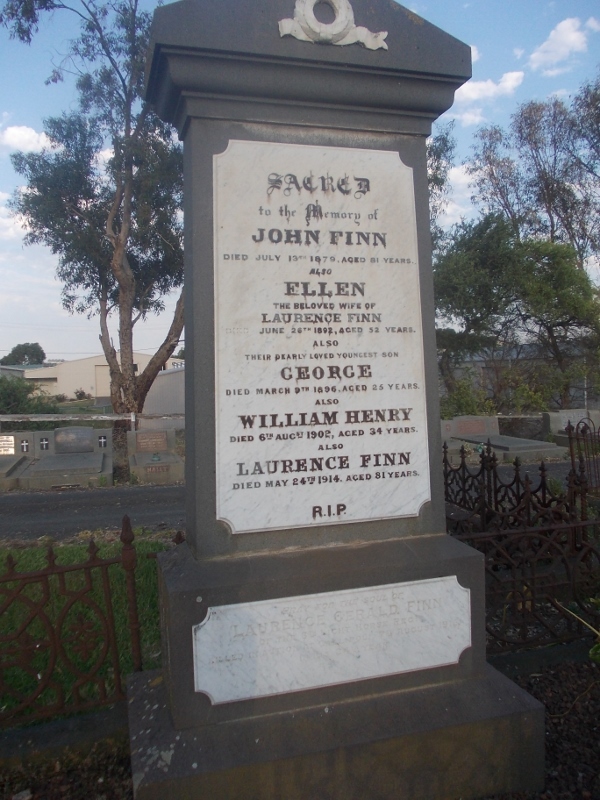 The next death in the Finn family was John’s daughter-in-law Ellen, wife of Laurence Finn. 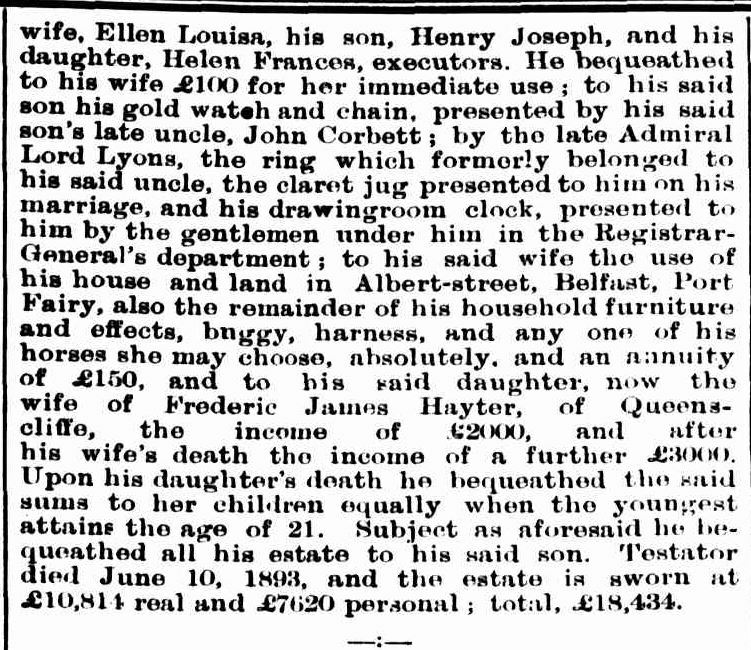 In 1896, Laurence and Ellen’s youngest son, George passed away aged 25. “Family Notices.” The Australasian (Melbourne, Vic. : 1864 – 1946) 21 Mar 1896: 45. <http://nla.gov.au/nla.news-article139723181&gt;. Just a handful of graves, yet so many interesting characters and stories. 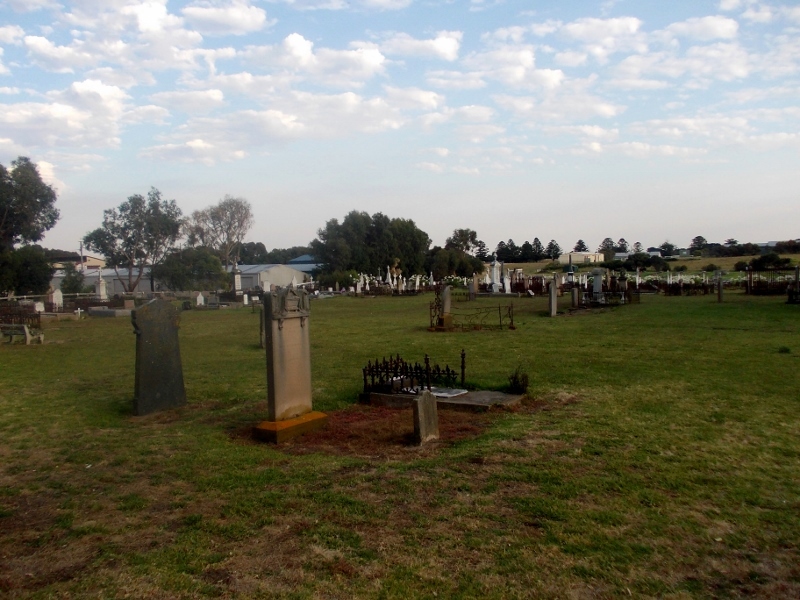 For more information about the Port Fairy Cemetery, check out the website – Port Fairy Public Cemetery. 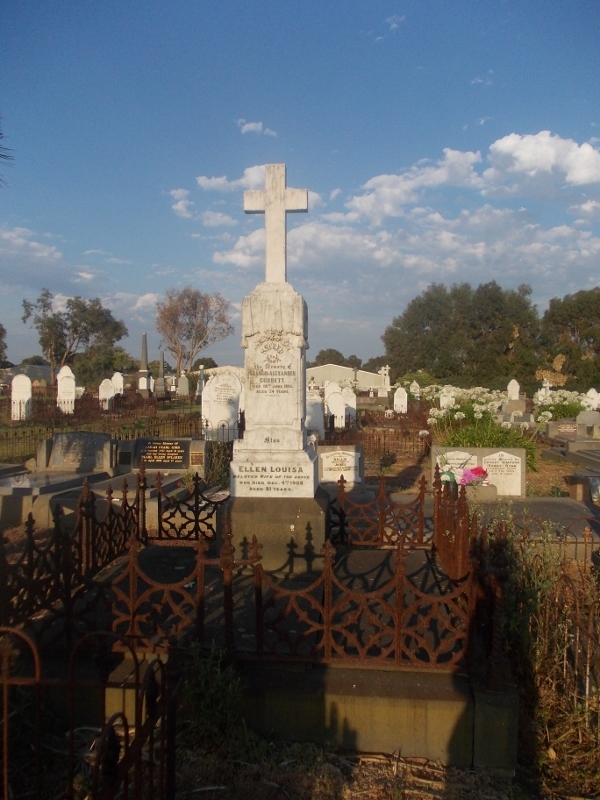 Also, ABC Local Radio did a great story on the cemetery including an interview with Maria Cameron and you too can listen to Maria talk passionately about the cemetery. There are also photos accompanying the story which are so much better than mine. It is available on the following link – Radio Interview. 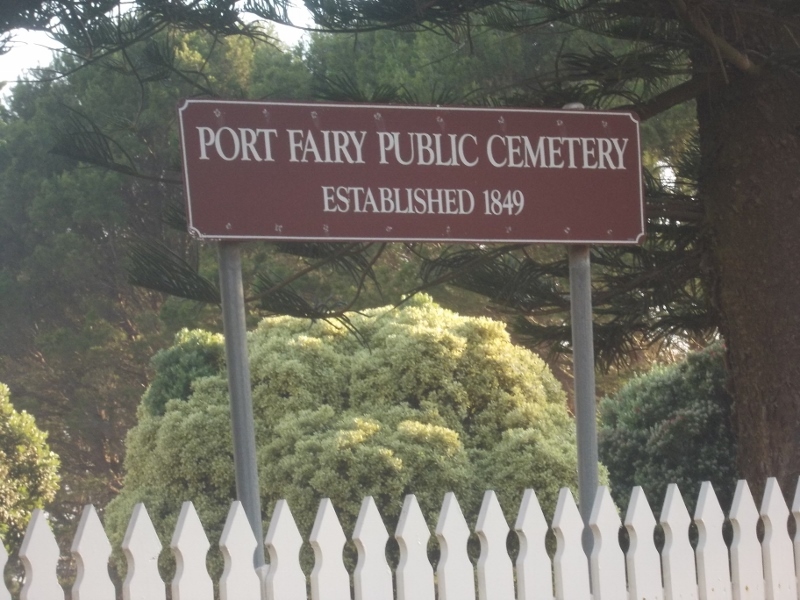 The Find A Grave entry for Port Fairy has had some great work done on it with hundreds of headstones photographed. This entry was posted in Cemeteries and tagged Andrews, Best, Corbett, Finn, Goldie, Grosert, Kirby, Laidlaw, Mills, Port Fairy. Bookmark the permalink. A great post and some great photos, Merron. I really like the first photo of the cemetery. Not only did you avoid the heat, but you got there early enough to capture the view in soft morning light. Thanks Merron, Sorry you didn’t have anything in your blog about the Huntly family. They were pioneers, as was his father-in-law Richard McDaniel (Mcdonald) who was the lighterman also drowned with Mr Best. Brilliant records of so many early settlers. Hi Merron, Just thought I would let you know that the link on Laurence Finn’s hearing – http://nla.gov.au/nla.news-article73880024%20 is no longer accessible. It should be working now Michelle.